This lens is virtually identical to its predecessor, the 15/3.5. The only differences are the A-style focusing and aperture rings, an extra "A" aperture setting, slightly softened edges, and five aperture blades of the instead of the six of the 15/3.5. Although it is very seldom that one finds the A 15/3.5 for sale used, any good photo store should be able to order it new. 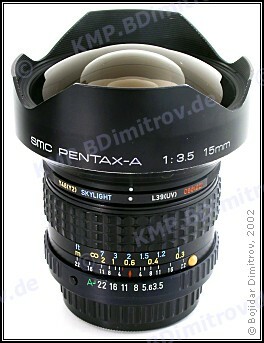 This lens uses the same optical construction as the 15/3.5 but supposedly features an improved SMC coating. It is then reasonable to assume that the "A" lens boasts somewhat better ghost/glare suppression while all other optical indicators remain virtually identical. Although I know of no side-by-side comparisons between the two lenses, user reports tend agree with the above.